A few days ago, this site predicted that “There is practically a 100% chance that something incredibly cool, of which this site was not previously aware, will make itself known.” Nobody was expecting a very strong candidate for the title to arrive quite so soon, and a very grateful tip of the hat to Ed Roberts of Breakout Manchester for pointing it our way. Each centre consists of a collection of Quests, which are independent and can be completed in any order. Each Quest consists of a series of 2-5 (possibly fairly small) rooms that must be completed in order. By way of an example, the Irish location, at the Lough Key Forest and Activity Park, has a total of 15 Quests and 47 rooms. 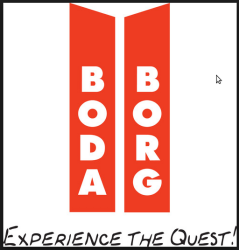 (The Boda Borg web site implies that the Swedish centres are larger, with 20-25 Quests each.) €15 per person will get your team access for two hours (during which time, two fully completed Quests is apparently a par score) or €20 per person will get your team access for the whole day. To complete each room in each Quest… well, that’s up to you, and the reason why Boda Borg is so interesting is that the instructions aren’t explicitly given, and you have to figure them out from context yourself. Quoting the web site, “Once you enter only teamwork using countless different skills, ingenuity, trial and error will allow you to survive the Quests.” Some rooms will pose purely physical challenges, others a mixture of physical and mental challenge; a colour-coding scheme on the doors hint at which are which. The official explanation video hints at the variety of challenges on offer, but also implies that one relatively frequent physical challenge theme is “don’t touch the floor” – but dressed up in sufficiently many different ways, and with such a variety of props to aid you in this, as to maintain interest. That’s cool; that’s fun. How does this compare to an exit game as this site knows them? It looks, principally, rather less labour-intensive. Teams are left to their own devices, attempting the Quests in the order of their choice – so, by implication, there is an assumption of good faith and good queueing between the various teams running round the site independently. (If there are many more than fifteen teams, and only fifteen Quests, perhaps the waiting might get a little in the way.) It’s also unclear quite how sophisticated the mental aspects of the various Quests are; presumably there are some deliberately very accessible ones and possibly also some rather more obtuse ones. Noting that Quests are independent of each other, it would be unfair to expect the degree of interconnectedness that you might find in (particularly a relatively story-heavy) exit game. It all sounds extremely promising, though how it might work in practice is another matter. From a distance, the best way to judge is TripAdvisor – and, as usual, better to read the comments than just go by the (generally very favourable) ratings – and to bear in mind that the people making them may have a wide range of sets of expectations going in. It’s worth bearing in mind that most of the comments reflect the entire park; Boda Borg probably comes off better than the park at large. If you’re the sort of person who is sufficiently game for a certain sort of laugh that you’re willing to make a journey to play an exit game, or to go out of your way to play with toys and environments so impressive as to be impossible at home, the odds are surely extremely promising for Boda Borg. (It reads like being as close as you’ll get, these days, to the sort of fun from the Cyberdrome Crystal Maze of old – except, twenty years later on, lower-tech.) Definitely one to follow as franchises spread around the world. It would be interesting to know whether the economics might make a site in Great Britain work, or whether our land and installation costs are just too expensive. The capital expenditure would surely be much more than that of a basic (almost modular?) exit game, but the potential daily throughput could be tremendous while being much less labour-intensive than that of a one-moderator-per-team exit game. The island of Ireland already has quite a tradition of exit games, and growing; the prospect of a tour some day to experience just all the games that it offers, let alone its other appeals, becomes more and more promising. Or, further afield, there are seven Bodas Borg to try in Sweden. Road trip! Just came across Boda Borg, which I’d seen in passing on your list of exit games. I’d never looked in great detail before, but having now read your article and seen a few comments online, I really, really want it to open in the UK! Can’t believe that something which sounds so good hasn’t opened more widely (also seems remarkably good value from the prices you quote). Ha, some of my UK friends were talking about it the other day coincidentally enough. While it may be attractively priced to play, it was very expensive to establish near Boston: US$3 million for construction alone plus the cost of the property.